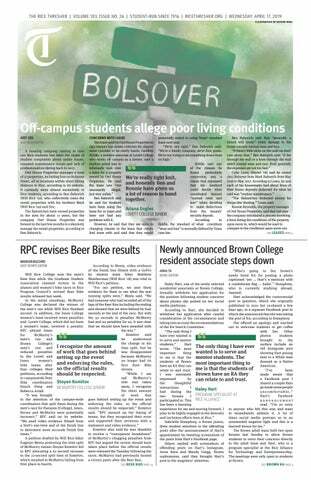 Students Transforming Rice Into a Violence-free Environment will have pilots at the other residential colleges starting next semester, according to STRIVE liaison Kusha Gupta. Gupta said she proposed the idea for the pilot after contributing to the “70 of 70” opinion piece about sexual assault in the Thresher. Hoping to fulfill the article’s call to action, Gupta said she created the STRIVE Supper Series because she didn’t want the discussion to end with the op-ed. Gupta and 16 small group discussion leaders — one at each dinner table — led the first dinner, which focused on consent. Gupta said she chose the topic with the help of the Office of Sexual Violence Prevention and Title IX Support, because consent is at the core of issues relating to sexual violence. The dinner lasted an hour on Nov. 12, and began with Gupta introducing the topic and discussing the meaning of consent. Then, discussion broke off into smaller groups, broken up by table. Gupta said holding discussions in the commons during dinner would encourage busy students, or people who wouldn’t typically engage in the conversation, to participate. During the small group discussions, discussion leaders, who were mostly recruited by Gupta, used a set of questions to guide the conversations but occasionally deviated from the outline to promote student participation. The questions ranged from the definition of consent to the gender and cultural constructs around the idea of consent. At the end of the dinner, Gupta encouraged students to fill out feedback forms and held a raffle for participants to win a $5 giftcard to Coffeehouse, which were funded by money Lovett set aside for STRIVE. Besides continuing education, Bruce, a Lovett senior, said the supper series leadership team hoped the raffle would incentivize students to attend. STRIVE advertised the event and the raffle through Lovett’s Facebook page and through college-wide emails. Gupta said one of the primary motivations behind creating the supper series is to prevent occurrences of sexual assault on campus. According to the Survey of Unwanted Sexual Experiences, which was administered to all Rice students in 2015, one in four women, and one in six people, have experienced sexual misconduct while attending Rice. While all freshmen are required to take a CTIS course the first five weeks of the fall semester, the classes were introduced only two years ago, so not every student has been through the material. Bruce said that alongside CTIS, the STRIVE Supper Series aims to start a conversation and educate students about topics otherwise avoided on campus. Moving forward, Hanszen College junior and STRIVE liaison Karen Qi said the leadership team hopes to receive feedback on the event and change it before introducing pilots at all 11 residential colleges next semester. After the pilots, STRIVE will initiate a full-length STRIVE Supper Series during the 2019-2020 school year. Other colleges, such as Duncan, have already begun recruiting discussion leads by sending out an email asking for students to apply.